When it comes to selling your property or purchasing a new one, Terrence Harding gels seamlessly with a diverse array of real estate clients and customers because of the strong connections and vast experience he's gained throughout his illustrious career. A prominent rapper in the music industry as a main member of Christopher "Notorious B.I.G" Wallace's rap group Junior Mafia, Terrence earned his way to stardom first as a performer, then as a real estate specialist. To expand his accomplishments, Terrence took his interpersonal, organizational and negotiating savvy "on the road" once more and embraced real estate full force. He became a top producer in real estate instantly, plus has helped A-list entertainment industry professionals and top sports figures find wonderful spaces for both residential and commercial purposes. 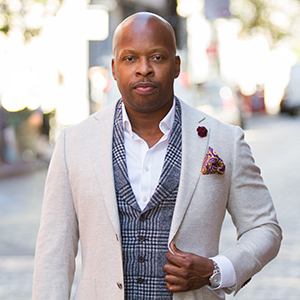 Being a native of Brooklyn enables Terrence to enjoy the best of most worlds working with Manhattan and Brooklyn-based clients, as well as foreign investors who relate to his worldly travels and seasoned experience. He has an incredible ability to get the desired results. This personable, loyal, service-driven and detail-oriented professional goes above and beyond for his discerning clientele, making every aspect of their real estate endeavors enjoyable and rewarding. Currently Terrence resides in a wonderful brownstone home in Park Slope. He is also an active community member who contributes extensively to worthwhile causes for kids and cleanliness of the local environment. Outside of work, he enjoys meditating, reading, dancing and travel whenever time allows.